Tock is a traditional game widely played in the province of Quebec. It’s simple to learn, yet it can be quite addictive and devastatingly brutal to play. I was introduced to the game by Bahá’í friends in Victoriaville several years ago, and it quickly became a favourite. The rules described on this page are “home-grown” rules, and are not quite the “official” rules which are generally included with the game when it’s bought. The goal of the game of Tock is to be the first to move one’s pieces around the board into one’s home court, using playing cards to advance and perform several types of special moves. I bought my board and accessories at a dollar store in Drummondville, Québec. You can get your own by looking online: Bô-Jeux Games is a good place to try. They have several sizes and flavours of tock boards, and the coloured marbles to go with it. Your local specialty gaming shop may also have it. 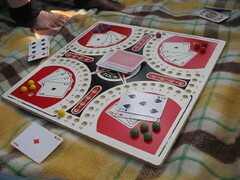 Each player begins with four same-coloured marbles in his start area (as shown above), and five cards that are dealt to him. To bring a marble out onto the track, a player must have in his hand an Ace (A) or a King (K). On his turn, the player must play the card and place his marble onto the post position (usually marked by an arrow or “start”). If the player has no Ace or King in his hand, he must discard and pick a new card until an Ace or King turns up. All players must keep five cards in their hands at all times, and one card must be played or discarded at every turn. Play proceeds clockwise around the board (except when a four (4) is used). Cards played are worth face value (A = 1, 2 = 2, … 10 = 10, J = 11, Q = 12, K = 13), and allows a player to move the marble of his choice ahead the number of spaces indicated. If a marble lands on an occupied space, it displaces the other marble and sends it back to its start area. Generally, a marble may ‘jump’ over other marbles while moving, regardless of colour. The exception is when another player’s marble is on its post position; in this case, no marbles may jump over it. A marble enters its home court by reaching the space directly below its home court, or the ‘doorstep’ (labeled ’17’ on the board pictured above), and moving the required number of spaces upwards. A marble may not enter another player’s home court. Once a marble is inside its own home court, it cannot leave, and can only go forward; if forward movement is impossible, that marble cannot be moved. When starting: Brings a marble out of your start area and onto your post position. When moving: Moves one marble forward one (1). When moving: Moves one marble forward thirteen (13), ‘eating’ every marble in its path – including your own. When starting: Brings a marble out of your start area and ‘eats’ another player’s marble (unless his marble is on its post position). When moving: Moves one marble forward eighteen (18), ‘eating’ every marble in its path – including your own. When moving: Moves one marble forward eleven (11), ORexchanges with another player’s marble (unless his marble is on its post position). When moving: Moves one marble BACKWARD four (4). When moving: Moves one or more marbles forward a combined total of seven (7) spaces. Fast-track: In this variation, a marble may use a four (4) to back into its home court. Team Tock: In this variation, opposing players team up to bring their team’s marbles home. Lose A Turn: In this variation, playing a ten (10) exchanges a player’s marble with another player’s marble, and a Jack (J) causes the player whose turn is next to discard one card and skip his turn. So what is meant by the Joker bringing a marble out & eating another opponent? Isn’t just like a King or Ace where you either use it as a “get out” card or the # “value” of the card depending on your situation? Also, after dealing 5 cards do you pick one on every turn to start so you always have 5 & always discard at the end of your turn?